Offered is a magnificent WAI KEE Chinese Export set of six silver and gilt tea cups (goblets) belonging to the mid 19th century, depicting in very fine repouss. 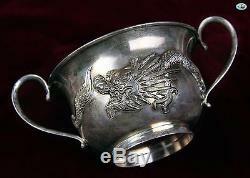 É high relief the full face and body of a dragon, beautifully designed around each cup. 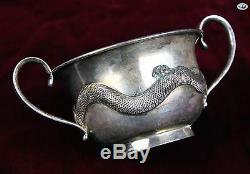 The silver hallmark of WAI KEE 90 SILVER, is visible on the bottom of each silver cup, in addition of each silver cup being embellished with a gilt interior. This wonderful antique WAI KEE Asian Chine Export set is in great antique shape and condition with the exception of some spots, natural toning, and patina due to its age. 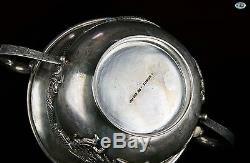 The following are the specifications for the magnificent WAI KEE Asian Chinese Export silver & gilt tea cup set. Height: 6 (2.5 cm). Diameter: 9.5 (3.75 cm). Diameter with handle: 14 (5.5 cm). Weight of one cup: 157 grams. Total weight of six cups: 942 grams.